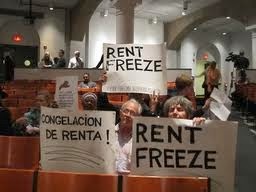 Petition & Rally for Rent Freeze in 2014! IS 2014 THE YEAR TENANTS WIN RENT FREEZE? Rally on March 27 at the Rent Guidelines Board. When Bill de Blasio called for a rent freeze, some balked at the idea. At that time, most pundits felt de Blasio's only chance at becoming mayor was to force a run-off in the Democratic primary. After winning the election in impressive fashion, Mayor Bill de Blasio has reiterated his call for a rent freeze. But even the most sympathetic elected official - much like Franklin D. Roosevelt - need to be reminded of how much his constituents care about certain issues. "I agree with you, I want to do it," he once told a group of reformers. "Now go out there and make me do it." Join a broad push from the tenant movement to make sure Mayor de Blasio does it - sign the petition for a rent freeze for the nearly 2.5 million New Yorkers living in rent stabilized apartments. And if you haven't already, sign up to get email alerts from the Real Rent Reform campaign. We're organizing a large demonstration for the first Rent Guidelines Board hearing on March 27th.